Magazines highlight it. Stores were created just for it. Blogs are written everyday concerning it. And I am a big fan of it. What is the it I am talking about?? And after reading our chapters for today you see God is a fan of it too!! Many of us fight organization for various reasons: it may not come natural to you, it is time-consuming, you don’t see the value in it, etc. I am most definitely not the poster child for organization, but I do try to keep things as organized as I can. My shoes are all in the same kind of clear container with labels identifying the shoes within it. All the manuals for every appliance and electronic in my home are located in one binder. All my important papers are properly filed away. Why do I do these things? Because it makes life easier! If I have a problem with my blender, I know where to go to find my manual. I don’t have to wonder what shoes I have to wear or where they are. But I am so glad I have a God that LOVES organization too! God does not organize because He is OCD; He knows it makes our life better! 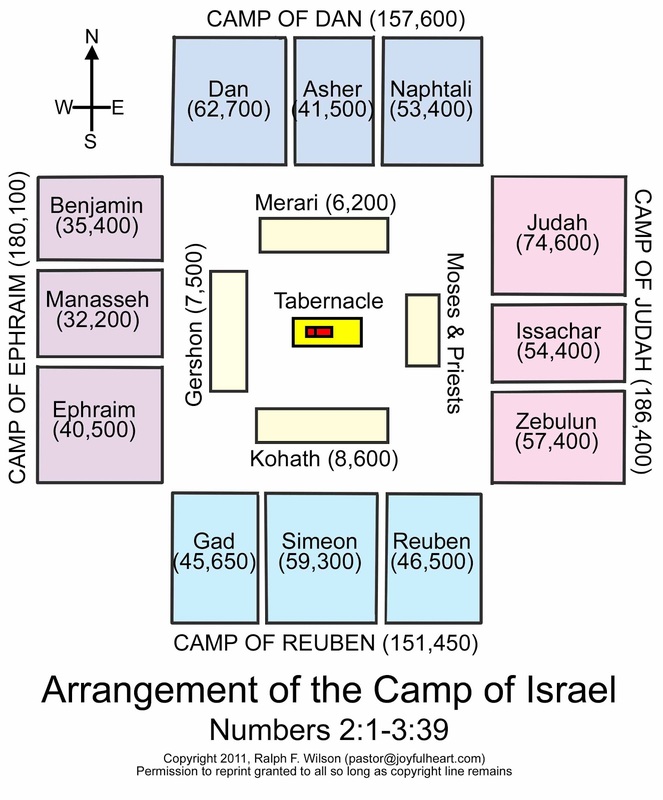 Here is how God had Israel organize their camp. I hope you notice what is at the center; the tabernacle. The place of God’s presence. God is at the center. Why? Because when God was at the center of Israel’s life and existence, everything was… BETTER! My home is so much more peaceful when I feel like everything is in its proper place. And my life is so much more peaceful when God is in His proper place. I know you have tossed a rock into a pond at some point in your life and watched the ripple effect it caused. Imagine that rock is God. When He is in his proper place (the center of our lives) He will effect everything else that emanates from our lives for our good. So my prayer for you today is that you would ask God to be the center of your life if He’s not already. And let Him effect everything in your life… for your good. Organization… It’s a God thing! !